From Bust to Boom to Bust again? In 1905 the Colorado River to burst through a very poorly designed irrigation canal in what was termed an “unplanned change of course”. 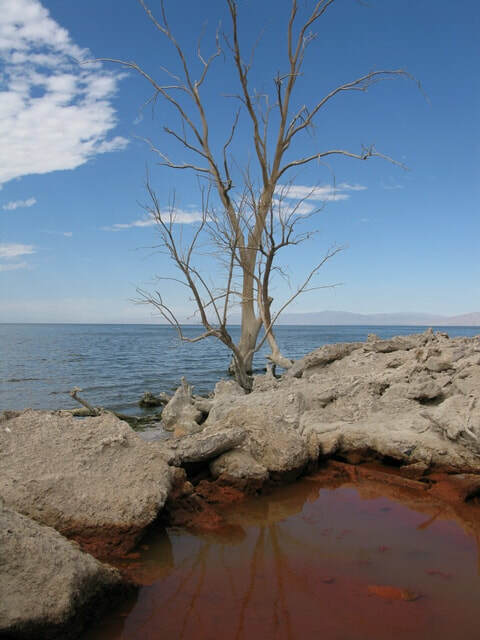 For over two years the whole of the river poured in, the Salton Sea, California’s largest lake, was formed. During its heyday in the late 1950’s it was referred to as bigger than Monte Carlo, Palm Beach and the French Rivera combined. It was one of the most popular destinations in the U.S.
By 1979 two tropical storms flooded out most resorts and marinas, many residents left, abandoning homes never to return. In 2003 a deal was made to transfer water from farms to San Diego, cutting water off to the sea. Without agricultural runoff the sea level will drop rapidly and the water will become uninhabitable to life. All that was in less than 100 years, the next chapter promises to be even more dramatic. Soon the sea will hit the tipping point, too salty to support fish and the millions of birds. The lake is an important stopover for 425 species on the Pacific Migratory Flyway. Currently there are a series of small ponds being created on the South end of the Sea for the wildlife. The plan for mitigating the dust is another issue, since 2005, 18 square miles has dried out. It is estimated by 2025, it will be over a 100 square miles more. Once the chemically laden sea bed has been exposed to the dry winds, it will create a noxious and toxic dust bowl. What, if any, plan there is for this is unclear. It has the potential to negatively affect 40 million people across the region.